For this weekend's stakes race recap, we start at PARX for the $1M Cotillion (G1) and $1M Pennsylvania Derby (G1). 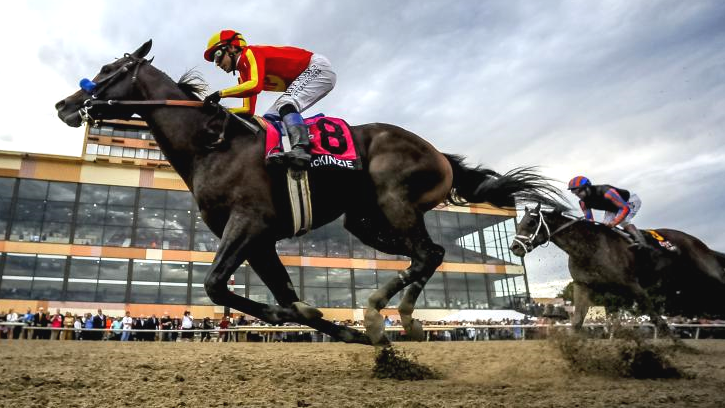 In the PA Derby, we watched Baffert work his magic once again as MCKINZIE came off a six month break to re-establish himself as a top 3 year old. As the field broke, it was TRIGGER WARNING and BRAVAZO who set the pace early with slow fractions. MCKINZIE kept pace with TRIGGER WARNING until the top of the stretch when he broke from the pack winning the race by two lengths. AXELROD took second with TRIGGER WARNING coming in third. Jockey Mike Smith was very happy with his mount, "He's an incredible horse. Bob had him ready to come off the bench at a mile and an eighth." In the $1 million Cotillion, the top fillies in the nation converged on PARX and not without a bit of controversy in the stretch. While we had MONOMOY GIRL picked for the win and MIDNIGHT BISOU for the place, MIDNIGHT BISOU ended up with the win due to an objection. As MIDNIGHT BISOU ran on the outside MONOMOY GIRL weaved out of her lane towards MIDNIGHT BISOU and then back in again. The filly weaved a second time causing jockey Mike Smith to have to move MIDNIGHT BISOU even further out into the center of the track to avoid hitting the other filly. As they entered the final sixteenth, the two fillies had finally found their tracks and MONOMOY GIRL crossed the wire first by a neck, but it was clear from the video that MONOMOY GIRL would be dropped in place by the stewards after Mike Smith lodged his objection. The result was MIDNIGHT BISOU with the win,MONOMOY GIRL second and WONDER GADOT third. From the Belmont, we head to Charles Town for the $300,000 Charles Town Oaks (G3). The trip these two fillies took in this race may have certainly been the difference in the results. The West Virginia bred LATE NIGHT POW WOW took the win, but runner up CHAUNCEY, the 42-1 long shot, put in a heck of an effort with a late bid, but had ran wide throughout the race resulting in second by a nose. Owner of CHAUNCEY, Anthony Chaudry, was very proud of the effort she put in, stating to watch for her in the G2 Raven at Keeneland. LATE NIGHT POW WOW earned her first graded stakes win at the Oaks, as did her owner and trainer Javier Contreras stating, "It might not be like the Derby or anything, but it's my Derby."